After the forming of the Iron Horde, Grommash visited Ner'zhul's clan and made him an offer: to join the Iron Horde or die. Ner'zhul accepted the offer but Grommash asked him to place a worthy offer on the table- an offer that would help in their campaign. Having access to no material of war, Ner'zhul chose to defile his ancestors by calling on the forbidden Void to save his people. While Rulkan understood his reasoning, she was not willing to commit the same act and so she left to Exile's Rise along with others who agreed with her and they became known as the Shadowmoon Exiles. While they remained mostly at peace, Rulkan would be visited by a liaison of the Prophet. Being good friends with him since before the Iron Horde, she allowed an audience with the liaison. She took Velen's friend in a cave underneath their settlement and told him of all that occurred. She then gave a Fragment of Anguish to help Velen and his allies enter Shadowmoon fortress but not before giving a proposition to the commander. 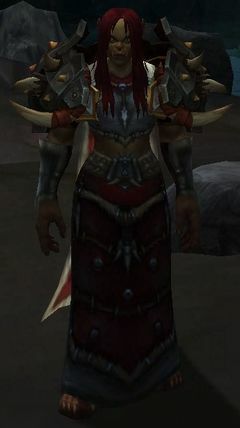 Rulkan is willing to follow the Alliance against the Iron Horde, swearing to fight for them in exchange for learning more about the commander's people. She can be seen in Highmaul's Coliseum watching her commander's battles. Ascendance—— The Shaman transforms into a being of raw elemental energy, increasing damage by 50%, healing by 50% and haste by 33% for 30 sec. Chain Lightning——Strikes an enemy with a lightning bolt that arcs to another nearby enemy. The spell affects up to 3 targets, causing Nature damage to each. Ghost Wolf——Turns the Shaman into a Ghost Wolf, increasing movement speed by 20% and attack speed by 50%. Hex——Transforms an enemy into a frog, rendering it unable to attack or cast spells for 12 sec. Stormstrike——Instantly attack with all weapons. In addition, Nature damage dealt to the target is increased by 20% for 10 sec seconds. Rulkan说： Can I be of service today? Rulkan说： Do you seek your own death? Rulkan说： Honor to you, commander. Rulkan说： I'm looking forward to this. Rulkan说： The elements are calling. Rulkan说： The eve of your demise is here. Rulkan说： Well fought, but not well enough. The main universe version of Rulkan died several years before the time of Rise of the Horde. The exact events that differed in this universe have yet to be detailed, but may be revealed in future content.